Jobs are in plenty. Even more, job websites are in plenty. So do you go on registering and searching jobs in all the websites? But all job openings are not listed in websites. When you apply for a job opening, how do you decide if the company is worth working for? There are hundred such questions which are all sorted through the Google Alerts. Google Job Alerts – What are They? These are nothing but the emails that Google sends to you when it searches and finds relevant information which you have told it to. So in case of job searches, it mails or sends alerts for job openings in areas you have specified and this service is free of cost. Google Alerts not only helps in finding job openings but also helps in finding information about companies, individuals and the areas of your skill set. How to Set up Google Job Alerts? 1. First step is to go to Google Alerts homepage. 2. On the homepage you get a text area written “Create an alert about”. Here you need to fill in what alert you want about. 3. If you are searching for a job in say, a managerial position, you need to type “jobs for manager post”. 4. As soon as you start typing you get a drop box with show options link and a “create alert” button. 5. When you click on “show options”, the options menu drops down. 6. The first is the “how often” option. You can select at most once a day, as it happens or at most once a week. If you don’t want your mail box to be filled with mails every day, you can select once a week option. This is for the Google Alert to send you message either through email address you provide or through direct RSS (Rich Site Summary) feed. So you can select the frequency of mails that Google Alert shall send to you. 7. The next interesting option is the “sources”. The sources include news, blogs, web, video, books or discussion. So you can select your required source or just select automatic which will include all the sources. 8. The next are the ‘language, ’region’ and ‘how many’ options which are quite easy to follow. 9. The last is the ‘deliver to’ option. Here it lists the email accounts already stored in your Google account. So you can choose how you would want the Google Alerts delivered to you. You can choose any of your email accounts or through the RSS feed. 10. Once you are done with selecting on all options you will have to click on the ‘Create Alert’ button. Your Google Alert is created for whatever alert you have typed. 11. You can create any number of alerts or multiple alerts in the same way. You can create one for say, ‘Jobs in banks’, ‘jobs in finance sectors’ and so on. 12. Try to filter and refine your search so that you get only the relevant mails. 13. And always read and retain relevant mails and delete the unwanted ones so that your inbox doesn’t get flooded with Google Alert mails. If you need jobs only in banks and not in any other finance sector, be specific. Write “jobs in banks” instead of writing “jobs in finance sectors”. This will streamline your search to only the jobs in banking sector. Likewise, when you are more specific and want jobs only in private banks, then enclose the alert in inverted commas. So type in “jobs in private banks”. Here you will receive alerts only for jobs in private banks. If you hadn’t enclosed it in inverted commas, then Google takes it as ‘jobs in private banks’ and also as ‘jobs in banks’ and lists all the bank jobs including the private ones. So you save the possibilities of permutation and combination and thus receive alerts only of your relevance. Now when you don’t want to include job in a specific organization, then make use of the minus sign. Say, you want jobs in the finance sector other than in government banks then type your Google Alert as “jobs in finance sector-government banks”. So here Google searches for all jobs in finance sector but excludes the ones in government banks. There is no space between the minus sign and the next immediate letter. There are times when you want your job search to be limited to only one website. In this case include the name of the website with the type of job you are searching. Like when you need to search for jobs in say CareerBuilder then create the Google Alert as “Jobs in finance sector” site:CareerBuilder.com. This will post you jobs in finance sector which are found only in the specified website. For Google to understand, do not keep any space between site: and the website name. It has to be continuous. When you search for jobs in two cities, then make use of the OR word. For example when you are interested in taking up a job in finance sector either in Mumbai or Pune, then type the Google Alert as jobs in “finance sector”(Mumbai OR Pune). Here Google understands that it has to search for finance sector jobs both in Mumbai as well as Pune. Now if you are searching for some executive jobs, be it in any department then typing the executive post becomes a tedious job. So you can write as jobs for “Chief * Officer” Mumbai. Here the asterisk includes every possible assignment like maybe executive, finance or marketing. So you get alerts for posts of CEO, CMO or CFO in Mumbai. When you want to include jobs in similar and related fields, then try inserting the ~ sign. Take an example, if you are interested in any jobs in the solar field then create a Google Alert as “~solar power jobs”. This will give you alerts in related words also like renewable energy jobs, solar energy etc. Here also remember that there is no space between ~ and the immediate letter. So now you are a pro in refining your search and limiting it to the ones that are relevant to you. Those weeds out the unwanted ones and you are left with the job searches of your choice. Why do you need Google Alert in your job search? Okay, you are done with creating job alerts and you know that Google Alerts help you in finding jobs, but what apart from that are the advantages of Google Alert? 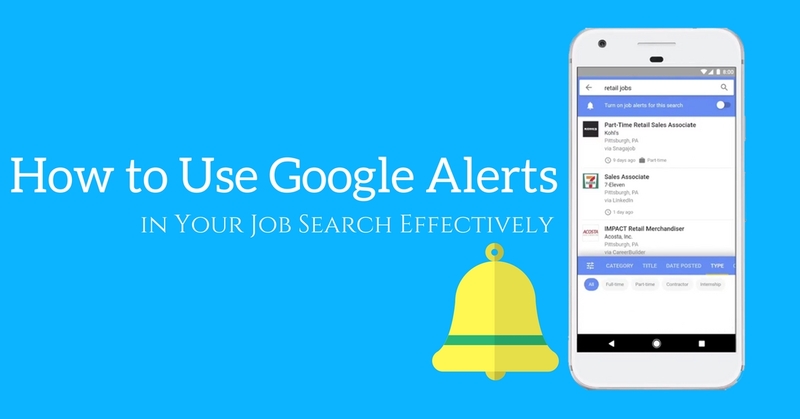 You can think of Google Alert as your buddy and assistant in searching, sorting and guiding you through your job search. And you get information pretty quick through Google Alerts. Don’t you want a job in your dream company? Aren’t you eagerly waiting for job openings in some companies of your choice? Google Alert helps you here. When you create Google Alert for jobs in the company of your choice, you receive emails instantly and you can apply for the job openings. If you are planning to move to a new city, then you wouldn’t be familiar with the job openings and the offices situated there. Also sometimes you would need to assess if a city has jobs which are relevant to you. All these are possible through Google Alert. Create alerts accordingly and you will know if there are job openings for your expertise in the location you are interested. You need to continuously keep on learning and upgrading yourself if you want to be relevant in your job. So what are the new skill sets you need to possess? Is it a compulsory requirement if you would want to change your job to elsewhere? What are the requirements of the job at present? What are the latest trends in the field that you feel you are lagging behind? All these and much more needed information is possible by tracking the job searches on Google Alert. 4. What is the salary you can expect? Yeah, Salary is in no way a lesser criterion in your job search. So when you need a job or when you need to change jobs, be aware of the salary provided for your caliber. This helps you to convey to the company the salary you may be expecting. If you get a job opening in a company, then do some research on the company with the help of Google Alerts. You can type in the company name and select news and articles about the company. The mails you receive about the company will give you information about its latest status and ongoing matters in the company. Why do you want to research about the company? You can impress the interviewers with your knowledge about the company. Because they would be impressed if you said that you know about the expansion plans of the company or that it was listed as the best firms in customer satisfaction. This helps to give you an edge over the other candidates in terms of your knowledge update skills. If there are negative ratings or news about the company, you can opt out of the job opening in that company. You can keep track of any customer complaints, lawsuits, employee unrest or high attrition rates among its employees. This is a red flag that the company’s reputation is not a good one and that you can skip applying for the current job opening or any in the future till matters are sorted out. So it works either ways. Either it helps you during the interview or it helps you not to go for the interview. Don’t limit you Google Alerts to only the job searches. When you want to stay aware of the current happenings in your job field create Google Alerts accordingly. Maybe if you are interested in the banking sector, you would want to know about the changes in the lending rates or some new schemes launched in the banking sector. You would want information about banks and their yearly profits. Basically you wouldn’t want to limit your search to only a few banks, but rather you would be interested in all bank related news so that it would help you to crack the interview. Yes, be specific when you want to search job openings. But expand your search when you want to gather information. There are millions of news and information being fed on the net every day. And there are some very useful tools to sort the information. It is upto you to know what information is relevant to you and how you make use of it. Keep up with the ever evolving technology as you never know, when it will help you with a job.